Butterfly Spreads are neutral Options Trading strategies involving simultaneously opening both Bull spread and Bear Spreads. Butterflies can be constructed using either Calls (a Long Call Butterfly) or Puts (Long Put Butterfly). 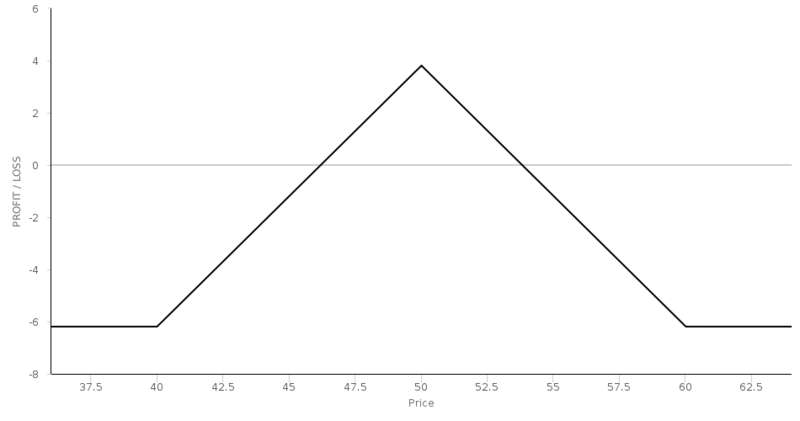 Butterfly Spreads have defined profit and risk. The trader achieves maximum profit if the price of the Underlying stays close to what it was at the time the position was opened. Maximum loss is incurred when the price moves above or below the lower or upper strike prices of the two wings of the butterfly. Investopedia video about butterfly option strategies. Investopedia article describing butterfly spreads. Options Guide Butterfly strategy overview. A butterfly trading strategy devised by Daniel Neagoy and described on his ThetaTrend blog. A guide to the Long Call Butterfly options strategy by the OIC (Options Industry Council). Detailed description of how to set up butterfly options trading strategies. Butterfly trade example with guidance on the best times to put on butterfly spreads, the so-called 'butterfly season'. Dan Neagoy discusses the different widths between the strikes of each wing that can be used for butterfly spread option trades. Mark Fenton describes a directional butterfly strategy with a high risk/reward ratio. This technique uses a butterfly above or below the current price (i.e. out of the money) which becomes highly profitable if the price moves towards the body. Mark Sebastian explains a butterfly spread adjustment strategy. Round Table with Dan Neagoy from Theta Trend who describes the CIB (Core Income Butterfly) strategy. Option Alpha guide to adjusting butterfly option strategies.